We are in the midst of house buying, everything seems to take forever and it’s very frustrating as I just want to get in well before Christmas, unpack and then start sprucing it up! I’ve got so many projects in mind, some big ones like replastering the walls to get rid of the weird textured plastering (hello? the 1970s called and it wants its walls back!) and some are a lot smaller. 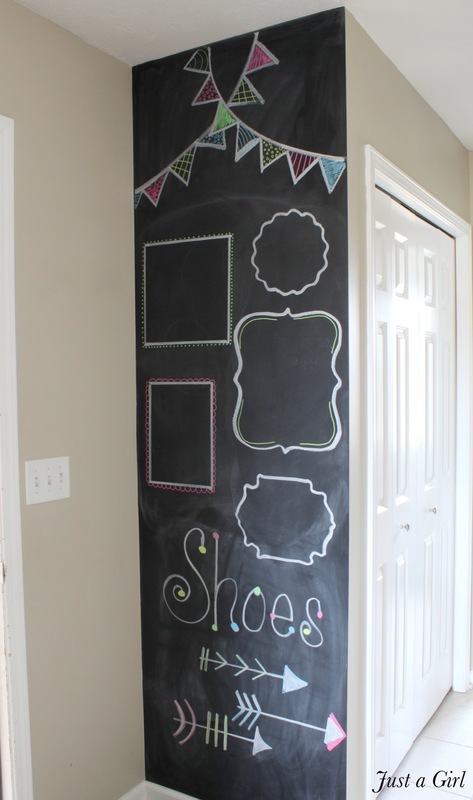 First up is a Chalkboard Wall. Now we’ve tried both the whiteboard and the blackboard vinyl that you can get to stick to walls in our current rented flat but neither of them worked that brilliantly so I really want to find a wall I can paint in the new home. Another plan of ours is a shoe-bench in the hallway. Somewhere to sit and put on/take off shoes with some storage for them too. I’ve found a few awesome ones made out of old pallets. I am always amazed by what I see plain old transport pallets turned into, and now I know why they always used to go missing from the hotel I work at when we’d put them out for collection! I also would LOVE to have a gloriously starry ceiling like this in the kids room (or in the bathroom, how amazingly relaxing would baths be then? A few more in depth projects for us would be to investigate the roof space to see if we could make it into a proper room, and to see if the funny balcony thing can be made into a proper balcony at the front of the building! Both these would mean we’d have to check that our buildings insurance would cover any accidental damage caused as a result of our potential improvements! Still, these seem less dangerous than knocking walls through, which Sam was ever so keen on when we saw a few places we didn’t make offers on! This is a partnered post, all words and opinions are my own. Next Post A plea: Non parents, don’t desert your parent friends! Exciting times, we’re hoping to be moving soon and I now want a starry ceiling in my new house! That looks amazing.